This recording of Richard Blackford’s Violin Concerto was made in the aftermath of its 2007 first performance in Brno with the same soloist (then conducted by Leoš Svárovský), but it does not appear to have seen the light of day before now. Unfortunately, I have to observe that the ten-year delay might well have been occasioned by the music itself. I have much enjoyed many of Blackford’s scores over the years, but the opening of the first movement sounds very much like a combination of Stravinsky’s Petrushka and Grace Williams’ Penillion over which the solo violin plays a theme which closely echoes the melody of the ballad from Britten’s Owen Wingrave. Later, when the music becomes more sheerly lyrical, there are intimations of Pärt’s Cantus in memoriam Benjamin Britten; and throughout there is an impression of heaviness in the orchestral scoring which in a live performance must inevitably leave the soloist desperately trying to be heard over the over-elaborate accompanying textures. Here, with the clear assistance of microphones, we can hear every note, but the sense of strenuous effort remains. Blackford acknowledges in his booklet notes that his music in the concerto “plunders material from an incomplete Violin Sonata written when I was eighteen” and unfortunately it appears that the five-week period during which the concerto was written was insufficient to allow him thoroughly to rework his teenage inspiration. The use of a Russian chant in the slow second movement brings a greater sense of repose, but otherwise the neo-classical busy-ness of the outer movements only intermittently engaged my sympathies. The playing of Maria Gajdosova, leader of the Brno Philharmonic, is excellent, however, dramatic and involved by turns. In his note the composer describes his Clarinet Quintet as “darkly chromatic” but here the slow second movement, with its setting of the Welsh hymn tune Cyffamod, is much more humanly arresting than anything to be found in the concerto. The quintet has an acknowledged programme which derives from Caradog Pritchard’s Welsh-language autobiographical novel Full moon, originally intended by its author to be a ‘radio play for voices’ on the model of Dylan Thomas’s Under Milk Wood but with a very much darker and more sinister undertow. David Campbell is asked to double clarinet and bass clarinet, and the furious opening of the last movement on the deeper instrument is arresting in the extreme especially when the programme – outlined in helpful detail in the booklet, with an excellent translation of Pritchard’s text by Philip Mitchell – is taken into consideration (it culminates in murder). The composer’s reference to various themes by descriptive titles (in the manner of Wagnerian leitmotifs) might imply that he may have been thinking of a full dramatic setting of the ‘play’; it would be interesting to hear this if it ever materialised. The phrase “The better angels of our Nature” comes from the inaugural address of Abraham Lincoln in 1861, but the music here is effectively a concerto for oboe and orchestra in two movements, much fresher in both inspiration and material than the violin concerto written six years earlier. It is interesting to note, as in the Clarinet Quintet, the use of descriptive titles to identify various themes. The work is very beautiful indeed, especially in the modal melody of what the composer describes as the ‘better angels’ theme. This opens with the solo oboe and builds to an impassioned statement on the full strings in octaves. Emily Pailthorpe is superbly controlled both in her extended cantilena passages and in the more vigorously excited sections, and Martyn Brabbins obtains a rich response from the string orchestra. Goodfellow is of course the Shakespearean nickname for Puck, established in A Midsummer Night’s Dream, and the music here is puckish indeed. The very opening again is momentarily Stravinskian in style – now echoing the passage describing the capture of The Firebird – but what follows is much more in Blackford’s own voice. In the section describing how Puck enchants the Athenian lovers the composer manages to skirt completely the obvious temptation to echo Britten’s opera, with the flute and oboe interweaving their lines over a restful piano accompaniment. All three players are superb and bring out all the character present in the music, bringing the disc to a bubbling and joyful conclusion. 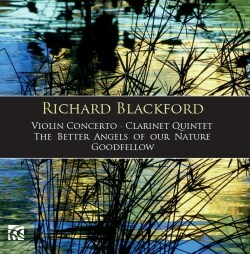 Although the four recordings assembled on this disc comes from widely different sources, with different acoustics and producers, the sound throughout is excellent and the twelve-page booklet supplies us with all the information we need to appreciate Blackford’s music. The composer himself is an excellent communicator, and his six pages of analysis are a model of what such things should be. This issue is a worthy companion to the catalogue of Blackford’s output on the Nimbus label. Might we hope in due course for a reissue of the old Argo LP recording of his Sir Gawain and the Green Knight, which never seems to have appeared on CD? In the meantime, those like me who relish Blackford’s music will welcome this addition to his growing representation on disc.